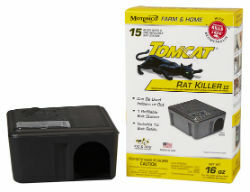 Refillable Bait Station contains one Tier 1 Refillable Rat Sized Bait Station with 15 x 30 gm Bait Block Refills. Tier 1 Stations meet EPA'S highest standard for bait station security and are proven resistant to tampering by children and dogs. Bait is made with Bromethalin – an acute, non-anticoagulant active proven to kills rats & mice faster than anticoagulant baits. Clear lid for easy bait monitoring. Each 30gm Block kills up to 3 rats, based on no choice laboratory testing. Approved for indoor and outdoor use.